Linux Mint Xfce on 32GB USB Drive | Linux DVD Shop - UK Linux Shop supplying Linux on CD, DVD and USB with Free UK Delivery, 24Hr Dispatch. Linux Mint 19.1 Xfce on USB is an Ubuntu-based distribution featuring the Xfce that provides a faster, more lightweight Linux experience by including browser plugins, media codecs, Java and other components for older computers. Linux Mint is compatible with Ubuntu software repositories, giving it access to over 30,000 software packages. Mint uses proprietary software to give the user a complete user friendly Linux experience. MintDisk: A software that mounts NTFS-partitions easily. Access your Windows files with ease. MintAssistant: MintAssistant will appear during first log-in for users, asking a few questions to ease the linux experience. It currently asks if the user want to enable or disable fortune-cookies in the terminal, if the root account should be enabled or disabled, and if Mint should use MintDisk or fstab to mount NTFS-partitions. MintUpload: MintUpload lets users upload files to a server by just right-clicking on it and press upload. The user will be given a link he can give to other people for quick and easy sharing. 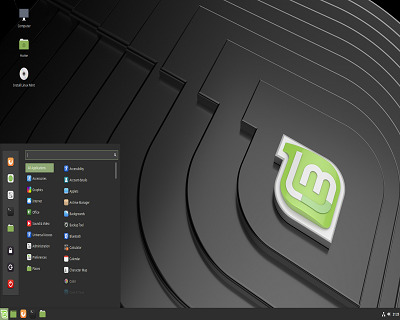 Linux Mint is now one of the most popular Linux distributions. Features include out of the box multimedia support, one click install feature, Microsoft Windows integration, 3D Desktop and a solid package base including Google Earth, Picasa and Skype.